What a difference a month makes. 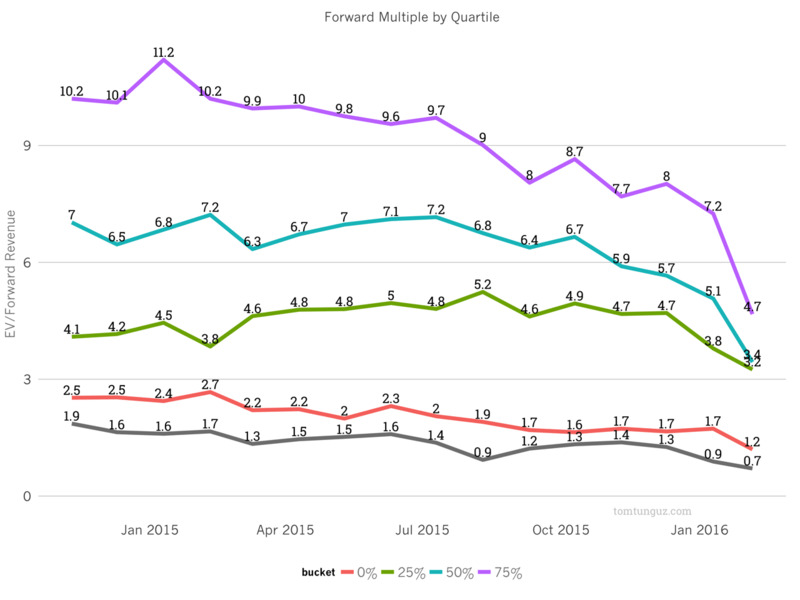 I wrote a post on January 10, 2016 called The Downward Pressure of Public Markets on Startup Valuations that depicted the slow decline of SaaS multiples in the public markets. Since then, multiples have compressed markedly. 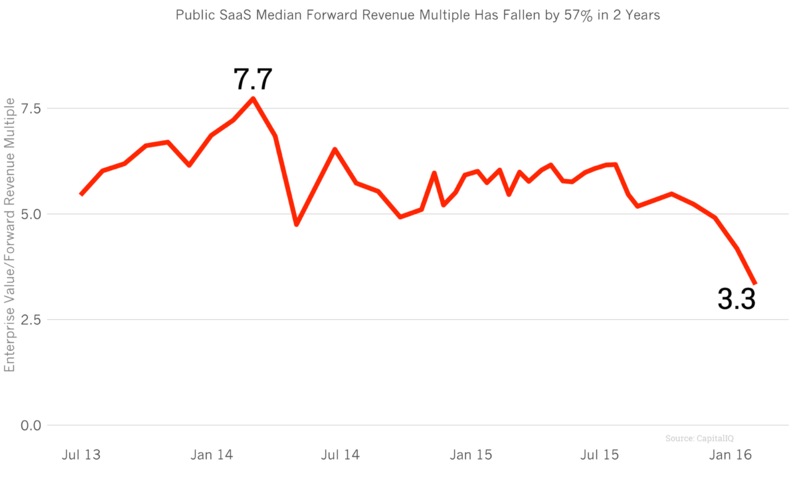 The chart above shows the forward revenue to enterprise value multiple of all public SaaS companies. Remember the heyday in March 2014? We’re 57% below that high at 3.3x forward revenues. A month ago, the market traded these businesses at 4.2x, so a 21% fall in four weeks, punctuated by a 40%-50% decline in LinkedIn and Tableau* last Friday. The quartile chart sheds a bit more light into the story. The high fliers in the top 2 quartiles fell furthest. To put the figures into perspective, a company generating $100M in revenue next year, growing at more than 70% annually, is worth around $500M. $100M in revenue - not ARR. If you were waiting for a substantial pricing harbinger for a weaker startup fundraising market ahead, this is probably it. Particularly so if the pricing decline we witnessed on Friday continues. Fundraising is a train and the public markets are the locomotive. It can take a while for the public market’s impact to be felt in the private markets, but there’s no denying the locomotive has halved its speed in 24 months. What does this mean? We’ve been in a seller’s market for many years. Now, for many parts of the startup ecosystem we’re entering a buyer’s market. Another type of founder leverage and option value become important. Another financial plan is key to weathering the environment. A different strategy is required. This isn’t like 2000. The go-to-market advantages of SaaS including faster sales cycles, beneficial cash cycles, online/mobile acquisition and bottoms up adoption are real, enduring , transformative changes. But we may be entering an era when 50% annual growth at cash flow breakeven is the norm, rather than 400% annual growth, burning multiples of revenue. Many software survivors of the dot-com crash pursued a more conservative strategy and were rewarded for their prudence. An example of a relatively extreme case, from 2001 to 2007, Concur grew between 0% and 35% each year. It took the company nearly five years to double revenue from $35.7M in 2000 to $71.8M in 2005, but they were nearly cash-flow break-even throughout the period. Ultimately, Concur sold for $8.3B. Operating a startup this way requires a financial and operating discipline that we haven’t seen in startupland for quite a while. If this pricing environment persists, that rigor may be the key to ultimate success. NB: Tableau is perpetual license, not pure SaaS, but I’ve included them because I consider them part of the new software movement.